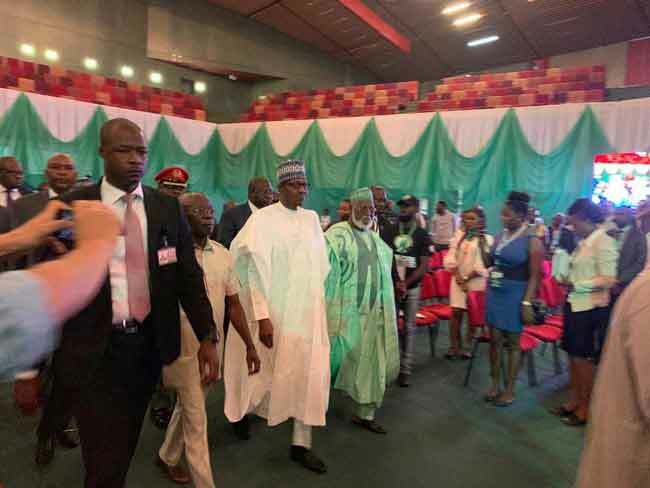 PRESIDENT Muhammadu Buhari on Wednesday disclosed that his administration has given the Independent National Electoral Commission, INEC, all the resources needed to conduct the forthcoming elections. He made the disclosure during the signing of the Peace Accord deal with other presidential candidates, including the Peoples Democratic Party, PDP, presidential candidate, Atiku Abubakar at the International Conference Center, ICC, Abuja. Buhari also urged other presidential candidates to ensure that the elections are peaceful. He disclosed that security operatives have been briefed to ensure a peaceful conduct of the elections. The president further cautioned the youths against allowing themselves to be used to cause trouble during the polls. According to Buhari: “We are witnessing an exciting development in the area of the engagement of our youths and women in the democratic process, hitherto these groups have not been in the mainstream of our political composition. It’s in our consideration that we passed the Not-Too-Young-To-Run bill last year. The success of the Act is illustrated in the unprecedented number of young men and women who have stepped forward to participate in this process at all levels. Significantly, we witnessed also the emergence of women as candidates across the political space. “The elections are taking place against the bedrock of the emergence and unprecedented number of political parties, as now the 91 political parties out of which over 70 fielded presidential candidates, although some have dropped out of the race, but there is no doubt that our country is moving forward and our democracy is expanding. “I call on all Nigerians to contribute to the building of viable country by more participation that goes beyond mere casting of votes, elections by themselves do not constitute democracy, it is the secret of citizenship, engagement and utilizing the energy of citizens towards attainment of good governance. “We have assembled here to mark the final phase of our campaigns and we are now at the doorstep of our elections. The campaigns so far has gone well and we thank God for that. For the few incidents for which people lost their lives we pray that God grant them eternal peace. “Now campaigns are over, our next assignment is for us all as citizens and contestants alike to go out and exercise our civic duties. We presidential candidates are here to sign and commit ourselves to do all that is possible to ensure the success of the elections but most importantly , I urge my fellow contestants to commit to this ideals that will keep our country and people safe. “The Independent National Electoral Commission, INEC, has already assured us that they have done everything possible to ensure free and fair elections, and to ensure this i made sure INEC gets all the resources they needed to perform their jobs. “Our security agencies have been fully briefed and they know that security is key to conduct credibility and success of the elections. “To members of the intentional community, i say welcome to Nigeria and thank you for standing by us, your presence helps to validate our process and commitment to our growing democracy. “As we go into elections in a few days time, please let us pray for our country, let use this opportunity to strengthen our beliefs in a united country. Our elections are important only to the extent that they make our country peaceful and prepare us for the development.